DON'T LET THEIR MILITARY MEMORIES FADE AWAY! Too often, the stories of service and sacrifice of our Veterans are never told and when they finally leave us, some faded photos, a few medals, and perhaps an old uniform are all that are left to remember what they did serving our country. Together We Served provides an opportunity for family members of veterans who have passed on to create a Remembrance Page of their military service, including memories and photographs, so that their story may live on for their children, grandchildren, and future generations. Your fully illustrated, step by step Help Guide will be sent to you in your welcome email. 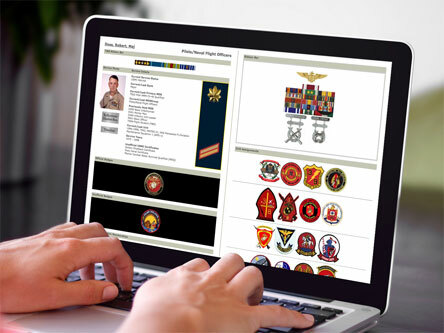 This enables you to interpret your Veteran's discharge certificate, identify medals, badges and insignia and can be used as a convenient worksheet. Gather your Veteran's discharge certificate, if available, along with all service photos, medals and awards, insignia, badges and citations. Enter as much information as possible into the Help Guide. Mark all the medal ribbons, insignia and badges awarded. Scan discharge certificate and service photos to upload to their service page photo albums. Now you are ready to start building their military service page which you can invite other family members to view or assist with. If you no longer have the discharge certificate for your Veteran, you may request a copy HERE. Enter all the information gathered on the Help Guide into your Veteran's military service page. Need help? Our online Help Desk, located at the bottom left of your screen, is just a click away! A complete service history will appear, complete with medal ribbons worn exactly as on uniform with all badges, insignia and unit patches correctly displayed. Add their photos to their photo albums - an album is available for each event in their service career - boot camp, unit assignment or duty station, combat operation etc. Click on the 'Shadow Box' link on their military service page to view a unique and beautifully illustrated presentation of your Veteran's military service which can be shared, via a personal web address, or printed out and framed. Capture your Veterans military memories in a feature called Service Reflections which becomes an integral part of their military 'Shadow Box'. Service Reflections is an easy-to-complete self-interview designed to help you record any information about key people and events your Veteran may have told you about their military service. You can support these Reflections with inserted photos.